Its been a while that I sat down to write a detailed review. But there wasn't anything that inspired me enough to do so. However, I am back with something that I have been using alot and loving too. And guess what it's by makeup revolution's sister brand I heart Revolution. Today we are digging into the Chocolate Orange pallete and trust me you won't want to miss this one! Let's get onto it. The I heart Revolution Chocolate Orange pallette comes in the classic revolution beauty chocolate bar packaging with orange cube pattern over it to give it the touch relatable to its name. The packaging, as always is sturdy and finely made that makes it look expensive and feels very luxurious in hand. The lid closes securely and is easy to carry around without fearing of it opening up in your bag. The pallette comes with a huge mirror which is such a plus for me because it really helps when you are on the go. There is also a dual ended sponge applicator included which is pretty much useless so won't be talking about that. The pallete includes 16 shades in total ranging from beige to brown to gold and oranges, making it truly a chocolate orange pallette perfect for those who love to wear warm tones on their eyes. The only thing that bothers me is the plastic cover that has shades mentioned on it which I always tend to lose, but thankfully people at I heart Revolution have heard it and have put the names under shades in newer pallettes. Coming to the formula, all the shades are Buttery smooth and pigmented. The colors blend nicely and the brush picks up enough product to show up on the lids. Only one shade Peel Swatched patchy and was a little hard to work with. But 1 in 16 works well. The finish differs color to color from mattes to satins to pearl. Even though you might find that the pallete gives you pretty less range of colors to work with but I keep on reaching for it as it gives you enough to work your eyes from day to night pretty easily. However I still feel a dark chocolate brown would have been a good addition to make it whole instead of two beiges in one pallete. - In One - vanilla (satin). The I heart Revolution Chocolate Orange pallete retails for 9£ and is available online at Tambeauty website, Revolution makeup, superdrug and amazon. In stores you can find it at any drugstore and super drug near you. In Pakistan this pallette is available at Beautybar.pk, Daraz.pk and Tambeauty.pk for about PKR 2300/- and also available at I Heart Revolution kiosks in major cities. 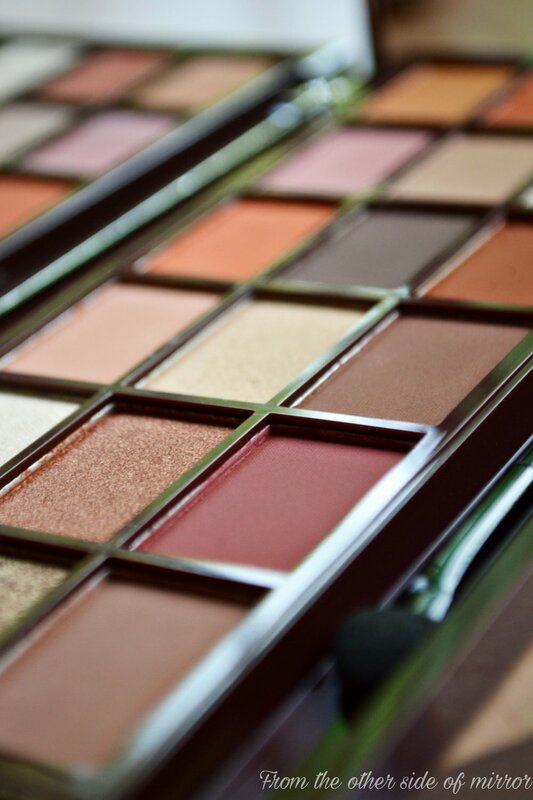 HAVE YOU TRIED THE CHOCOLATE BAR PALLETTES FROM I HEART REVOLUTION? WHICH ONE IS YOUR FAVOURITE OF THEM ALL, DO LET ME KNOW IN THE COMMENTS SECTION BELOW.